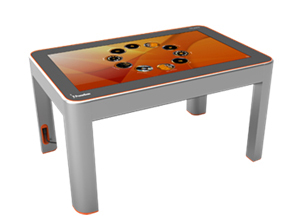 ActivTable is an Interactive table with a 46-inch HD LCD touch-sensitive display that supports up to six students at one time. Designed to engage learners aged four to 11, the ActivTable enables flexible opportunities for collaboration, from small group learning to special needs and whole class activities..
ActivTable meets accessibility standards by providing easy table access for chairs and wheelchairs. Encourage small group learning and engage students with an Interactive solution that helps students develop life-long skills such as collaboration, communication and critical thinking..